Once you've established your ad platform and Google Analytics connections, Funnel will start importing your data. 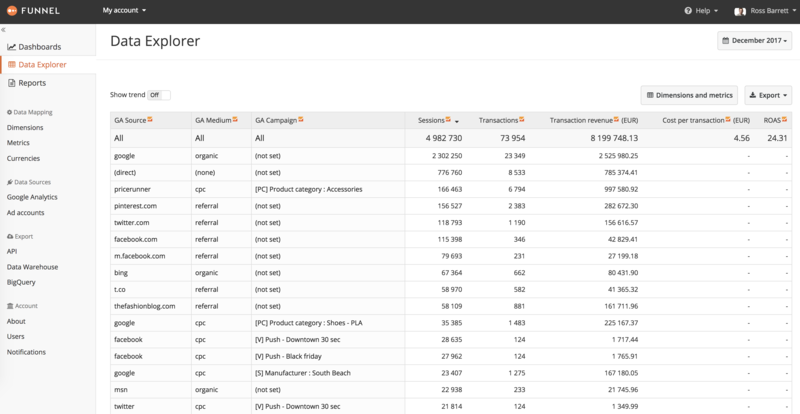 Although you'll most likely want to teach Funnel how to categorise the data from your various connections (by traffic source, market or campaign, for example) you can start exploring the raw data straight away. 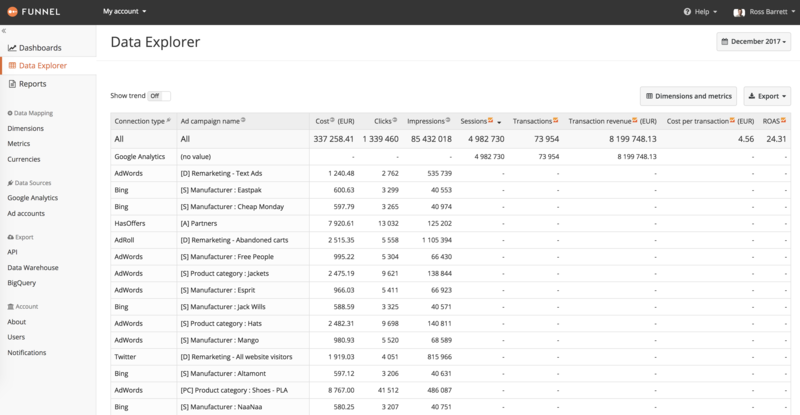 When looking at the 'Connection' dimension in the Data Explorer you'll see one row for each of your data sources. Since each row represents a connection, some metrics only have values for some rows. Cost, for instance, is pulled from your ad accounts and not from Google Analytics, which is why rows showing Google Analytics connections do not show any cost. can't be shown on rows for ad platform connections. Analyzing your data per, for example, traffic source, market or campaign with the data from the various connections mapped together requires teaching Funnel how to think of your data. This is done by creating dimensions, which we cover in another article. However, before creating dimensions it is useful to look into the raw data to understand what data you have available and how it looks. Hitting the "Dimensions and metrics" button above the table opens up the dimension selector which lets you choose what you want as rows in the table. Under the headline "Data Source dimensions" you'll find the segmentations your raw data comes with. The data you're looking at now is in its raw form which can be tricky to use for understanding how cost relates to transactions, for example. As mentioned above, doing that analysis requires teaching Funnel how the data from the various connections is related. However, having an understanding of how the raw data looks and how to access it is helpful in understanding what possibilities you have when grouping the data by creating dimensions.